Space Safety » Archive » Space Exploration » Destination Mars » Will Apollo Training Inspire MarsOne? In the past months, two companies announced their plans to train and launch a human crew to space in the next decade. Whereas the European based MarsOne promises to establish a Martian outpost by 2023 and plans to initiate an astronaut selection process in 2013, American Space Exploration Corporation recently announced their Lynx Academy competition that will award the best candidates with a free space trip. Moon walk training (Credits: NASA). While details of the training program of either of these projects are not yet fully known, let’s have a look into the past, to see where they can draw inspiration from. No doubt that the biggest leap into the unknown ever performed by mankind was the 1969 Apollo Moon landing. After President Kennedy stated the importance and priority of this endeavor in his famous 1962 speech, it was obvious that before the commencement of the mission, every detail would have to be rehearsed and tested to make sure everything goes as smoothly as possible. Special emphasis was, of course, placed on the preparation of astronauts. Looking at the photographs capturing the training, one would say they must have had a lot of fun. 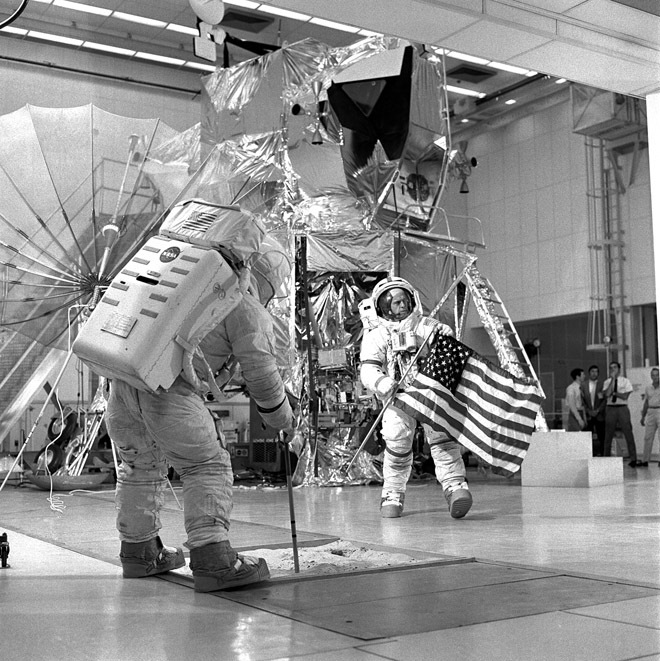 Planting the flag, an important part of the mission (Credits: NASA). They practiced extensively for every single sub-part of their mission, including planting the flag, crisis scenarios, survival in the jungle and emergency landing. One of the foreseen challenges that received special attention was motion in reduced gravity. With Moon’s gravity being approximately one sixth of that on Earth, it was obvious that walking on the Moon might be difficult (or extremely easy considering the fact that subjectively the astronauts would feel physically so much lighter). 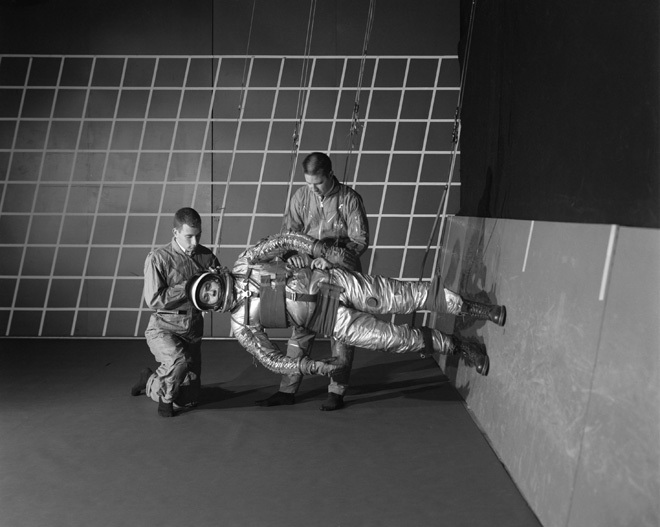 A reduced gravity simulator was therefore built and used for training since 1963. Clearly, not only the astronauts’ motion but also the landing was expected to be affected by the reduced gravity. The Lunar Landing Research Vehicle was therefore created to simulate the lunar landing conditions. The vehicle was constructed out of tubular aluminum and equipped with a powerful engine capable of slowing down its descent to the speed equivalent to a descent in lunar gravity. 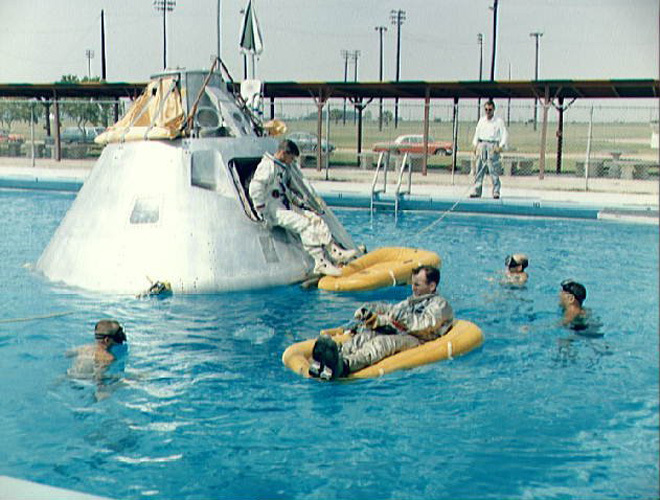 Having fun in the pool, or water landing training (Credits: NASA). Such indispensible space training equipment as the Neutral Buoyancy Facility or G force creating centrifuges were used extensively. The Neutral Buoyancy, or underwater training, makes it possible to experience conditions similar to microgravity and go through the obstacles of working in such conditions. A $2 million Lunar Orbit and Let-Down Approach Simulator, nicknamed Lola, was developed to prepare the pilot of the spacecraft for how he would perceive the lunar surface prior to establishing orbit of the moon. Inside the cockpit, a closed circuit television and special panels and models represented portions of the Moon’s surface as seen from different altitudes. The pilot could learn how to spot important visual cues during the landing operation. The astronauts practiced how to collect rocks from the Moon’s surface, how to drive a rover, and also went through a parabolic flight to fully experience micro-gravity It’s probable that some of these training strategies will find their way into modern spaceflight initiatives such as the MarsOne program.